This date could make for a fun evening getting to know your spouse's "alter-ego".... with little effort, planning, or money! So, hop on computers at different houses, two different computers in the same house, or take it public to an internet cafe! Maybe after a few chats, you'll feel ready to "meet" each other in person! Ooh..this could get exciting! You can snag the Word file of this HERE. Then, I'll have him set up on the laptop with some hot cocoa (while I use the desktop). Keep in mind that this date is great for all types of situations. It can be a quickie date at home for nights when going out or getting a babysitter just isn't an option. If you have two laptops, it's a fun way to get out of the house without having to spend money (since you'll be sitting at an internet cafe). Enjoy lunch or dinner at Panera Bread while using their free wi-fi to chat. As always, I'd love to hear your suggestions and/or comments. Let me hear it, people! This is a fun idea. It reminds me of the movie "Four Christmases" when the main couple "meet" in a bar as different people. ha...that's funny you mention that Courtney. I wrote about "Four Christmases" in my "cocktail night-in" post. loved that movie. Aww cute idea! My husband and I sometimes talk chat online when we are both in the same house for fun lol, but it would be fun to pretend to be someone else! This would also be really cool to do when my husband is deployed. great idea--can't wait to do this date! 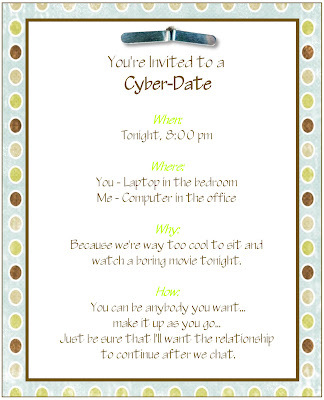 I would love to know what program you use to make all your invites and all your cute downloads. I have been looking for something with cute fonts for a while but haven't found anything yet. Any help would be appreciated. Thanks!